What Does It Take to Create Effective e-Learning? Developing effective e-learning requires expertise in Project Management, Computer-based Instructional Design, Multimedia Design, Instructional Technology and Quality Assurance. It is rare for a single person to have mastered all of these skill sets. Therefore, developing effective e-learning often requires a team approach which leverages the unique skills of each contributor and also ensures an efficient e-learning development process as each contributor can focus on their core competency rather than having to muddle through elements that they are not experts in. 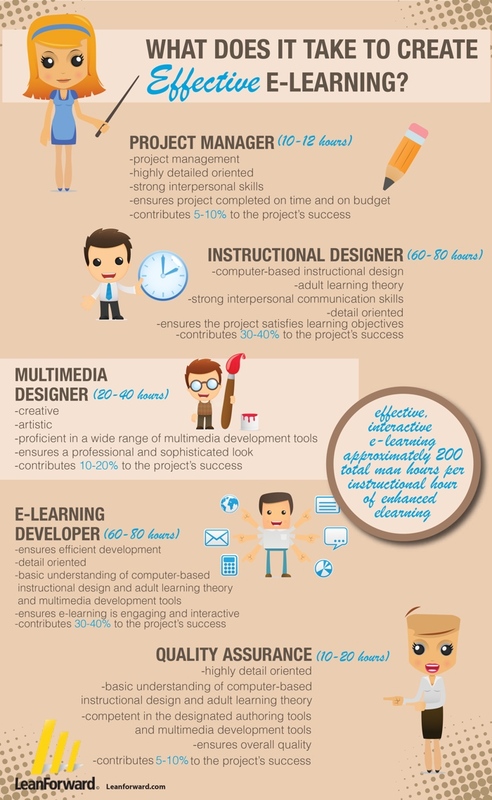 The following infographic from Leanforward highlights the five key skill sets required to develop effective e-learning as well as the primary contributions of each team member.